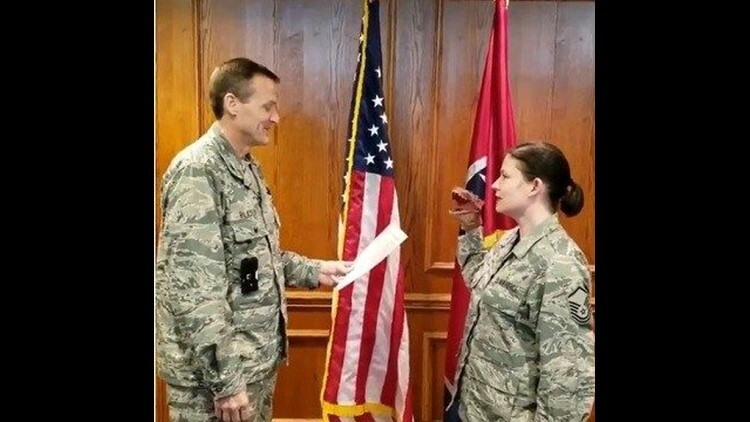 A video of a Tennessee Air National Guard public affairs officer using a dinosaur hand puppet during her re-enlistment ceremony has provoked outrage from senior officials and tough punishments for everyone involved. Master Sgt. Robin Brown used a hand puppet to mouth her words as she recited the re-enlistment oath Friday. A video of the ordeal racked up millions of views and sparked a social media firestorm after it was posted Saturday on Facebook with the caption, "Remember when the Profession of Arms was taken seriously?!?" Maj. Gen. Terry Haston, the Tennessee Air National Guard’s adjutant general, said in a statement Wednesday he was "absolutely embarrassed that a senior officer and a senior (non-commissioned officer) took such liberties with a time-honored military tradition." Haston announced the colonel who led the ceremony was demoted and forced to retire. Brown was removed from her position with the Tennessee Joint Public Affairs Office. And the unidentified, senior non-commissioned officer who recorded the ceremony was reprimanded and removed from his position as a unit first sergeant. He will stay with the Tennessee Air National Guard. "The Tennessee National Guard holds the Oath of Enlistment in the highest esteem because that oath signifies every service member’s commitment to defend our state, nation and the freedoms we all enjoy," Haston said in his statement. "Not taking this oath solemnly and with the utmost respect is firmly against the traditions and sanctity of our military family and will not be tolerated." Haston's statement comes two days after the director of the Air National Guard, Lt. General L. Scott Rice, said on Facebook he was "equally shocked and dismayed by this event that mocks such a cherished and honorable occasion." News of the punishments sparked more controversy on social media Wednesday evening as some questioned whether they were too harsh.